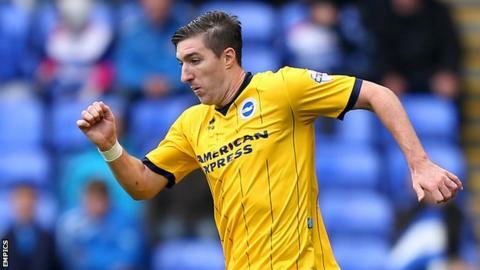 On-loan defender Stephen Ward says Brighton have the infrastructure in place to be a Premier League club. The Seagulls have only spent four years in the top flight in their history, between 1979 and 1983. "It is definitely a club that on the outside is ready for the Premier League," Ward, 28, told BBC Sussex. "The stadium is probably the best in the Championship and once the training ground is in place it will be a real coup. It will attract players here." Albion's average league attendance of 27,285 this season is the highest in the Championship and more than 20,000 supporters have renewed their season tickets for next season. The club are also set to move into a new training ground complex this summer. "In terms of the size of the club, it is a massive club going in the right direction," left-back Ward added. "To have facilities like that and the fan base is something every club going into the Premier League needs. "The squad we have here is very similar to the team I got promoted with at Wolves [in 2009]. Hopefully we can go down a similar path." Brighton are unbeaten in their last four games and are seventh in the table, only outside of the play-off places on goal difference. "I think in the last few games we have had more of a ruthless streak about us and there is a good buzz around the place," the Republic of Ireland international said. "The manager has drilled into us to be more clinical and composed in front of goal and it has paid off. "A couple of weeks ago people were maybe writing us off to reach the play-offs and we have turned it around. To be in with a real good shout is massive for us. "If we can do the business over the next four games and get into the play-offs, everyone is relishing the chance after going so close last year."